There's been a LOT of news in the past couple of weeks, so we thought we'd update you on all the official word of the latest happenings across the world of Disney, in case you missed anything! On the tails of the recent announcement of two new Disney Cruise Line ships (un-named as of now) being built for 2021 and 2023, today we learned that returning in early 2017, Disney Cruise Line Guests can celebrate the legendary adventures and iconic characters from the Star Wars saga during Star Wars Day at Sea. 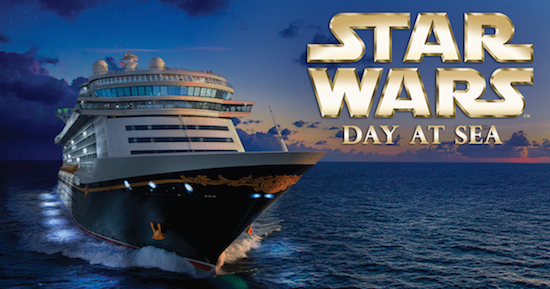 Each sailing features a full day of dark side and light side fun, including official appearances ofStar Wars characters, a deck party and fireworks, Star Wars-themed family and youth activities, at-sea screenings of Star Wars films, unique food and beverage offerings, and special merchandise. Departing Jan. 7, 21; Feb. 4, 18; March 4, 18; April 1 and 15, 2017, the western Caribbean itinerary includes Cozumel, Mexico; Falmouth, Jamaica; Grand Cayman and Disney’s private island in the Bahamas, Castaway Cay. Departing Jan. 14, 28; Feb. 11, 25; March 11, 25; andApril 8, 2017, the eastern Caribbean itinerary includes Tortola, St. Thomas and Castaway Cay. Give your MEI & Mouse Fan Travel agent a call, or visit Mouse Fan Travel for a free, no-obligation quote! Over at Epcot® Character Spot, located in the heart of Future World at Epcot, the area is expanding for even more great meet & greet fun. 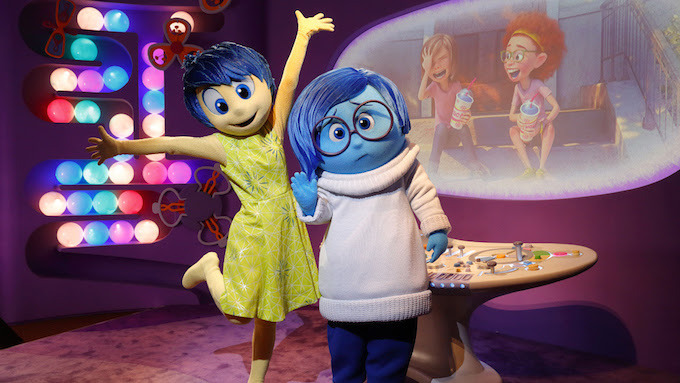 Beginning in April, Epcot Character Spot will provide direct access to Headquarters, where you can meet Joy and Sadness, two of the Emotions who help guide Riley through life in theDisney•Pixar film “Inside Out.” On the way to Headquarters, your Clients will journey through Riley’s long-term memory, catching a glimpse of her Islands of Personality before joining Joy and Sadness at the console. Over on the west coast, Luigi's Flying Tires opened Monday in Cars Land at Disney California Adventure® Park. Get a behind-the-scenes look at this all-new attraction in this video below! As was announced a few weeks ago, the Disney California Adventure Food & Wine Festival will take place during weekends in April, beginning April 1, 2016 at Disneyland® Resort. In addition to Festival Marketplaces, which will be serving up the best of delicious California cuisine, the festival will also feature chef demonstrations, seminars celebrity chef appearances and more. Culinary Demonstrations featuring some of the best chefs in the industry, including some favorites from the Disneyland Resort, will take place on the Backlot Stage in Hollywood Land. You can learn new techniques during these 30-minute complimentary presentations. Seating is limited. Stage 17 in Hollywood Land will be host to the Celebrity Kitchen. Here you can catch some of the biggest names of the culinary world, including superstar chefs Guy Fieri, Graham Elliot, Claudia Sandoval, Robert Irvine and Disneyland Resort Signature Dining Chef Andrew Sutton, as they share tips, treasured recipes and behind-the-scenes-stories while they demonstrate how to create their personal favorite dishes. An autograph signing will follow each chef appearance. Cost is $99 per person, plus tax and gratuity. While the Disney California Adventure Food & Wine Festival is included in regular theme park admission, additional fees for seminars may be required. Space is limited. Guests must be 21 years of age or over to participate in some events; valid ID required. Subject to restrictions and change or cancellation without notice. 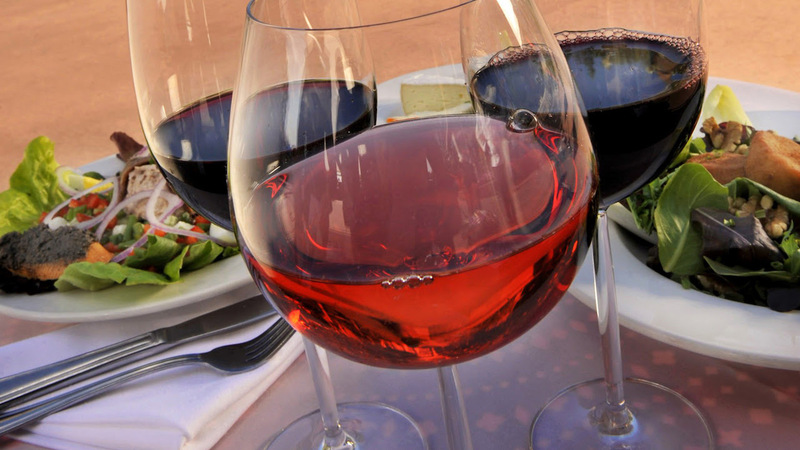 Reservations for Beverage Seminars and Celebrity Kitchen experiences can be made by calling (714) 781-DINE or visiting disneyland.com/dine. 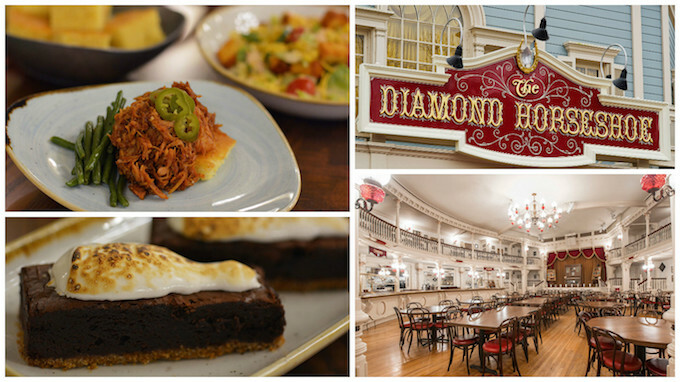 Back over at Walt Disney World Resort, soon you can enjoy a new table-service dining option at Magic Kingdom® Park, when you mosey on over to The Diamond Horseshoe in Frontierland, serving lunch and dinner daily beginning March 13, 2016. For main fixin’s, Guests can choose from BBQ pulled turkey served over cornbread, spit-roasted ham served with country beans or stewed beef served with mashed potatoes. Each entrée is served with a side of seasonal veggies. As the finale to this hearty feast, Guests can choose from an apple tart or the Campfire Brownie—rich chocolate brownie on a graham cracker crust, topped with toasted marshmallow. Soft drinks, tea, coffee and milk are included with the saloon feast. Cost is $33 plus tax for adults, $19 for children ages 3-9. Meals are one table-service entitlement on the Disney Dining Plan. Reservations are now available for dates from March 13- May 30, 2016 and can be made by calling 407-WDW-DINE. Online reservations will be available soon. For more info about any or all of the news stories above, head over to Mouse Fan Travel and request a free no-obligation quote from one of our knowledgeable agents!